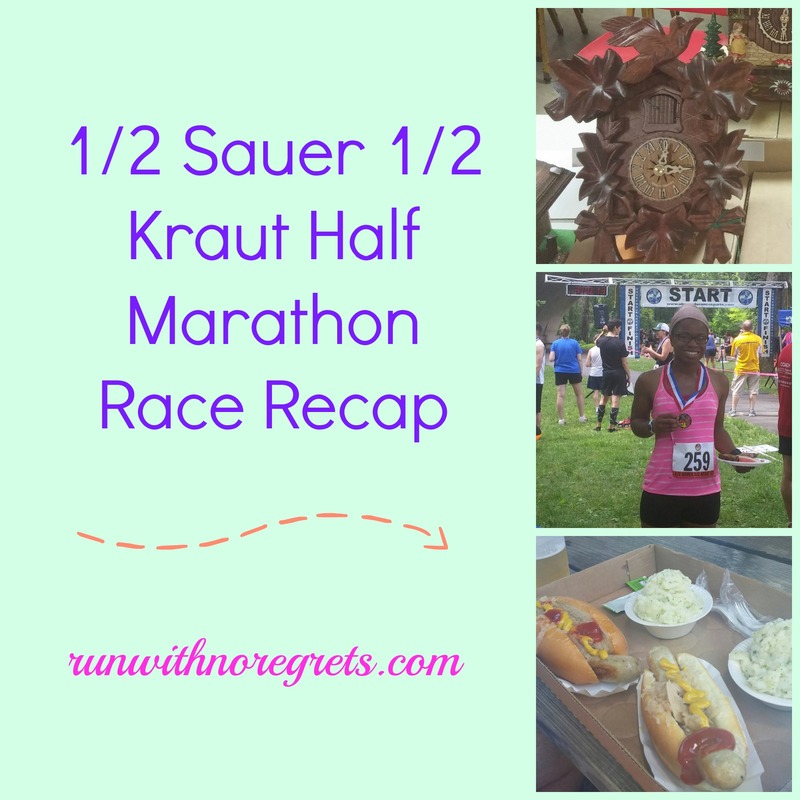 The 1/2 Sauer 1/2 Kraut Half Marathon was an amazing experience, and I’m still riding the high. There were a lot of ups and downs and as I mentioned last week, the weather was forecast to be brutal! But after 8 weeks of training, I’m so excited to share with you the details on how this race went down! The days leading up to the race involved me drinking as much water as humanly possible. I wanted to make sure I combated any issues with dehydration because we had weather in the upper 80’s and 90’s all week long. I also wanted to “carbo load” a bit and overall increase my carbohydrate intake for a few days prior to the race. I’m not sure if it made a difference, but I thought it would help. The night before the race I made sure my clothes were laid out and I tried to get as much sleep as possible. Bret made a tasty dinner of chicken, vegetables, and pasta. The heat has been awful in our place so we didn’t get the best night’s rest since we kept waking up in the middle of the night. Bib pickup was available on race day between 5:45 and 6:45 am. So the first alarm clocks went off at 4:15 and 4:30 am….early, right?! I really didn’t get as much sleep as I would have liked leading up to the race, so I was a little worried about feeling sluggish. I had a cinnamon raisin English muffin with strawberry preserves for breakfast. And I continued to hydrate throughout the morning. We left our place a little after 5:30 to get up to the Cannstatter by 6 am. It was an easy drive, but it was surprising that the parking lot was already packed. Thankfully there were plenty of spots still available so we went inside to pick up our race materials. Since Bret ran this race last year, everything was very familiar. Technical T-shirts from past races put on by Uber Endurance Sports were on sale for $2 for charity so we bought a few. 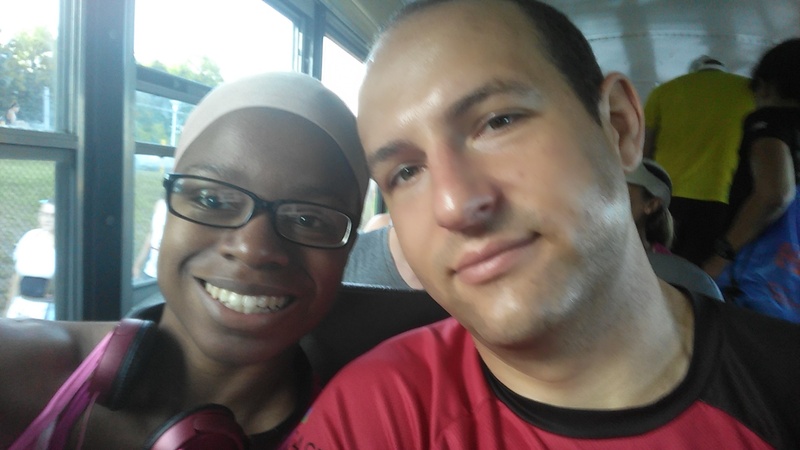 Before I knew it, it was time to head to the shuttle bus and head over to Pennypack Park. It was around 6:30 am by the time we got to the starting line area, so we had an hour of time to kill and hit the potties. Thankfully, Pennypack Park was much cooler than I expected! We even had a few nice breezes while we were waiting around to line up. There weren’t as many people participating this year as last year from what I can tell, probably because of the 90 degree plus weather that was predicted to plague the race. Still, there were plenty of people around, many wearing Bavarian attire and getting into the German spirit. There were about 800 runners in all, so this was by far my smallest race. Bret was running in Wave 1 and I was signed up for Wave 3. They didn’t waste much time and I didn’t even have time to get a good shot of the starting line as we headed off. The race spends most of its time on a bike trail that is maybe 6 feet wide? So we were going to be packed in pretty tight for awhile. They pumped up the German music and we were headed off! I was nervous of course as I took off but I kept my race goals at the forefront. Once we heard that the severity of the weather on race day was confirmed, Coach Kristy told me to throw my goal of 2:20 out of the window and run by effort, not by pace. I didn’t really know what she meant at the time, but I definitely get it now. The race started out pretty well for the first couple of miles. Since I ran an 8 mile training run on this trail the previous week, I was familiar with every turn and every hill for the first few miles, and this definitely made a difference. Once I got to mile 3 it was time for my first set of Clif Shotbloks. This was a complete mess. I use a Nathan handheld water bottle that is pretty small, and I had 2 packs of Shotbloks stuffed inside the zippered pocket. I was fumbling around trying to get the pocket open, rip open the packaging, and stuff 3 gels down my throat. I still have not coordinated a way to handle this while running, so I always have to walk. I felt like I wasted too much time and it was frustrating. There were a couple of points along the course where there were spectators cheering us on, which was very much appreciated! I got high fives and lots of smiling old people, which was great. Most of the race was in the shade, which was a huge relief! Unlike the Zooma Annapolis 10K, I didn’t feel like I was sweating to death during my run. So overall, I was feeling pretty good, well enough that I skipped a couple of the water stations. Things started to get interesting after mile 5. First, the hills were much more steep and much more frequent. So this is where I realized what “run by effort” means. I didn’t care what the watch said! Kristy told me to walk up the hills as needed, but I just couldn’t let myself do it. Everyone around me was racing with a combination of walking and running. Did I mention that it was humid and in the 80’s? But my stubbornness wouldn’t let me walk beyond the hydration points. We were running along Pennypack Creek and it was absolutely gorgeous. I wish I could have stopped to take pictures but I’ll be back out there another time so I don’t take a bunch of blurry photos! I had my Kid Cudi Pandora station keeping me focused, with lots of post-Recovery Eminem songs playing for some reason haha. Soon we were getting to a part that was off the bicycle trail and out into an open area. We were running on half the width of what was essentially a sidewalk, and there were bushes that made things even more uncomfortable. This little stretch was definitely my least favorite part of the course, because running around orange cones isn’t that much fun. We were getting close to the halfway point of the race (thank God) and there was a point on the course where we had to make a sharp left and run in some grass to get to the “real trail” called Mount Cuckoo. Somehow, there was a bike on the other side that was coming right at me, I screamed, and then I was hit by the bike. I got hit by a bike during a race! Thankfully it was only my arm, and she was very apologetic, but you know me, I said it was okay and kept it moving. There was no stopping me. I was irritated though! Finally, we got to the Mount Cuckoo section. This was where it really felt like a trail race. You couldn’t even really go two by two it was so narrow, and it was pretty treacherous. But it was also fun! My “nemesis” was still playing cat and mouse with me, and there were a few other people who were on my heels. The trail was the real deal, with horse poop and all. Thankfully I never got tripped up – Bret warned me last year that this part was really tough (plus it was full of mud puddles). Everything on the course was labeled very well so there was no way you could get lost. The latter part of this portion of trail was tough though because the terrain changed to rocks that were pretty difficult to run on, and then it started to go downhill with very awkward “foot steps” you had to take. But once we got out of there it was time to get back on the course to make our way back to the finish. On the tightest trail of the race, dodging horse poop! Unfortunately, the wheels started to fall off at this point. Really, it began around mile 9 or so, when it just felt like things were dragging. Everyone around me looked miserable. I was looking forward to being done. It was cool though that we would see the super speedy marathon runners running in the opposite direction as us, and I would occasionally cheer them on as they passed, especially if they were women. The marathon runners had to run our course twice! Still, it seemed that every half mile past 10 was torture. I decided that I wanted to finish strong and pushed myself, finally passing a few of those that were along the course with me. I just kept it going and hoped and hoped that I would hear the crowd at the finish line soon. Each turn in the trail I would think “this is it”, knowing that it wasn’t…goodness I was ready to be done! Finally, I’m nearing the promise land. I see Bret cheering me on to my right, and I keep pushing to get to the finish line. I try to make it look good for the photographer, lol, and that’s that! 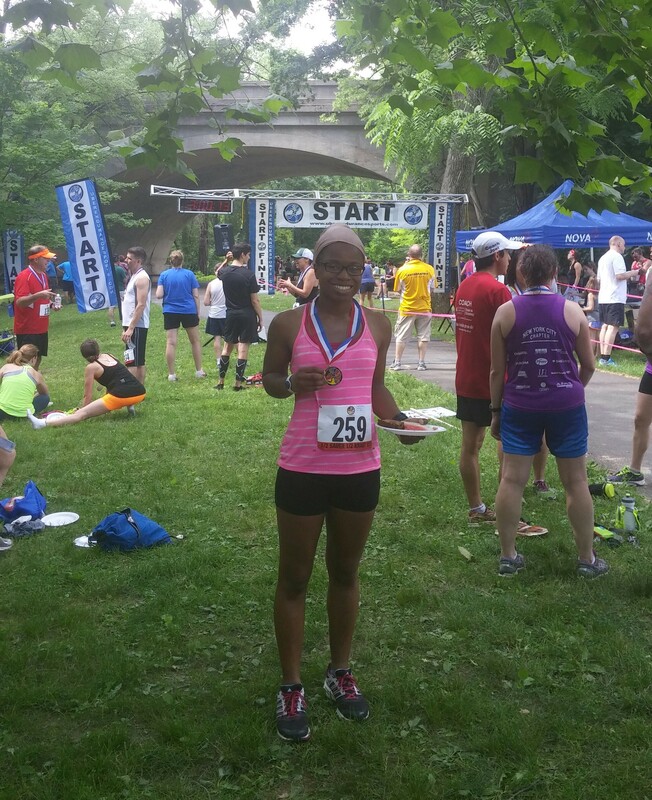 I finished my first trail half marathon! My official race time was 2:35:48. I have to be honest, when I saw the final time, I was bummed out. I really didn’t pay attention to pace beyond the first mile, but I was still hoping that I was a little faster than that! Oh Janelle, the things you do to yourself sometimes…The bottom line is that this was the most difficult race I’ve ever run. Ever! And it was done with temperatures in the 80’s with maybe 70-80% humidity! With hills, hills and more hills! When I crossed the finish I was completely out of my mind. I was so exhausted and just hoped Bret would come find me and tend to me, haha. He finished in 1:57! I’m so happy for him. He was dealing with some minor injuries the past month and was almost doubtful whether he’d be able to run at all but clearly, he handled business! I didn’t have much of an appetite but eventually I had a little bit of watermelon, some Twizzlers and homemade coffee cake. It definitely beats boring bananas right?! Smiling at the end of the race! After settling down and trying to dry off a bit we finally headed to the race afterparty back at the Cannstatter, where I was finally able to change into a clean set of clothes. There was live entertainment by German dancers in costume, but by the time we got there they were finishing their set. We got in the very long line for beers and had to go German of course, and then got our bratwursts with sauerkraut and potato salad. Everyone got a beer and food ticket included with registration, but still everything was really cheap. We hung out and applauded the award winners. There was a best lederhosen contest and the fastest marathon time was 3 hours…insanity! A special highlight was the accordion performance by Mr. Uberhans himself. I love accordions! For dinner we kept the celebration going and went to Chestnut Hill for dinner at Earth and Bread Brewery. 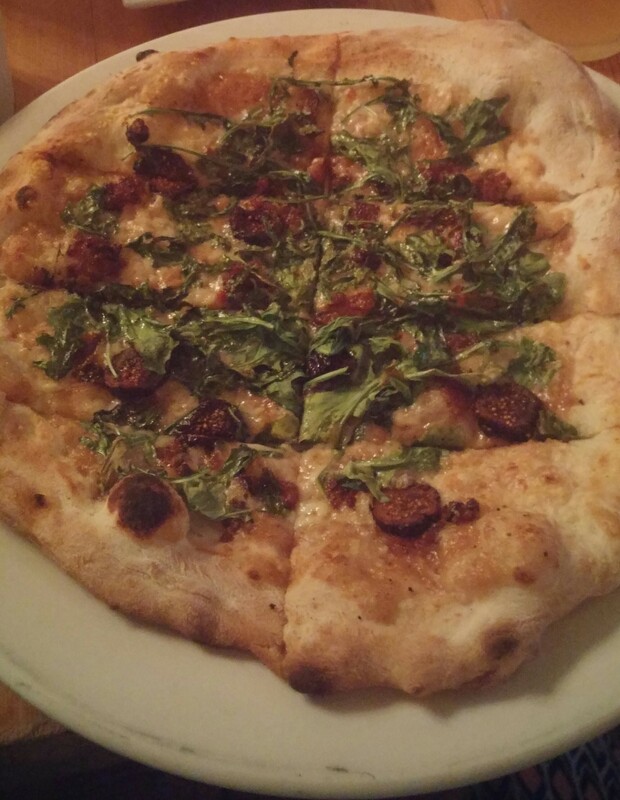 I got the Continental flatbread with roasted garlic sauce, bacon, figs, asiago, parmesan and arugula, paired with their Jenever Saison….amazing! We had a really nice time. The 1/2 Sauer 1/2 Kraut Half Marathon was an incredible race. I am so happy to have ended my racing season on such a high note. It was so easy for things to “go wrong” with my fears about the heat and humidity, but thankfully everything went well, from hydration, to overall race organization. I highly recommend this race for anyone who is sick of the same old same runs in Philly, for people who like trails, for people who don’t take themselves so seriously! I have to say that if I would change anything, I would have given myself another week for a long run longer than 10 miles. I didn’t really have too many of those during this training cycle, and my body seemed to know that too. While I did finish strong towards the end, it was pretty painful. The mental toughness wasn’t where I like it to be. But I’m so happy I was able to conquer this race! Very affordable registration. The cost of the race was around $60-$70 for the half marathon and maybe $10 more for the full marathon. You can’t beat that! Extremely well organized. We didn’t get a dozen emails from the Race Director over the past several months, but when we did get our information, everything we needed to know was included. There was no way to be confused about what was going on when you got to the race, so that was great for my peace of mind. They also really handled the hot weather well. Not your average race. It’s not the big corporate race that you may be used to running, and I love that. You can tell that the community worked really hard in making the race a success. Nice swag. A really nice medal and well-made technical shirt is all I need. Sure the design is the same every year, but it’s still a gorgeous medal! Great energy overall. Pedestrians on the race course were friendly and runners gave the thumbs up as they passed in he opposite direction. People carried funny signs. Volunteers dressed up in German attire. Mr. Uberhans and his accordion were on the course with a huge smile on his face. No one whined about the heat. What’s not to love? Limited changing areas. 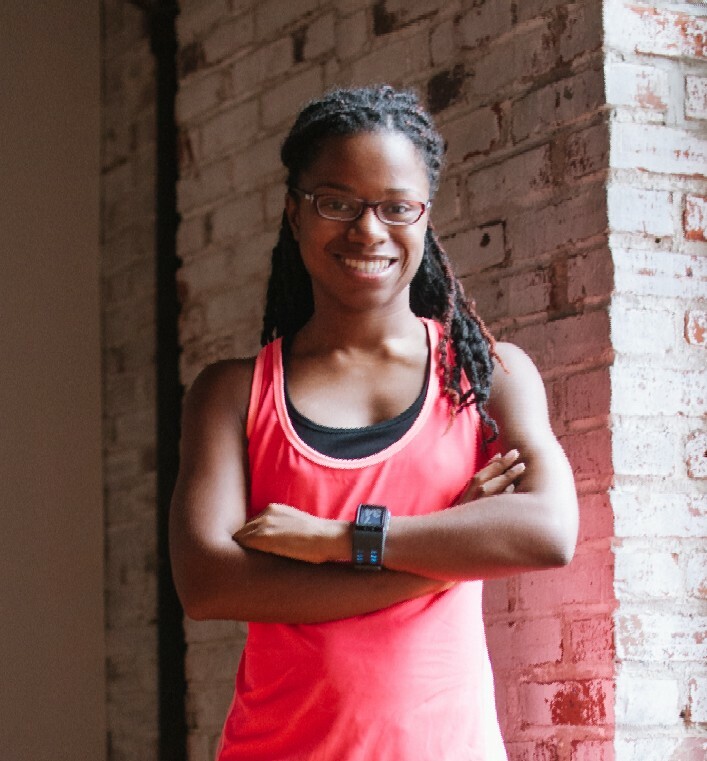 My only real problem was that when I wanted to change out of my clothing after the race, I had to choose between the porta potty, the tiniest bathroom stall of my life, or my car. I went with the teeny, tiny bathroom. So that was a bit of a challenge. That strange part of the course leading to Mt. Cuckoo trail. It wasn’t my favorite as it was congested and running in grass felt a bit “random”. Still, I’m reaching to find any cons to this race. This race was a long time coming and I’m so happy that it went well. As always I have to thank Coach Kristy for another great race in the books! I did miss a couple of short training runs in this cycle but I still feel like such a stronger runner now. There were points where I wanted to quit and I didn’t. The training really made the difference. I’m glad that Bret and I were able to both participate in this race together. It was a lot of fun, even though we weren’t on the course together. It was just a really great day. 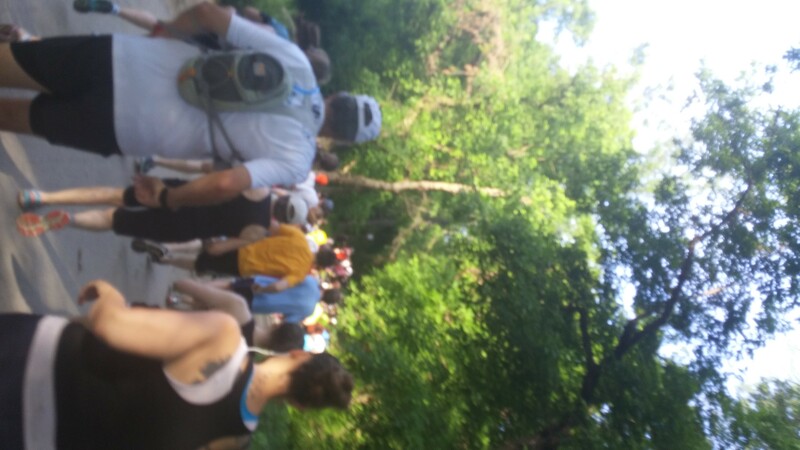 Last, I have to thank everyone who made the 1/2 Sauer 1/2 Kraut Half Marathon possible! I had an amazing time and very little to critique! The volunteers were awesome, the entertainment was great, and it was just a really great atmosphere for everyone involved. I’m just grateful that everything worked out, and now I can finally REST because Spring racing season is officially over! Note: I’ve also posted my review of this race on bibrave.com – it’s a free site 100% dedicated to race reviews. 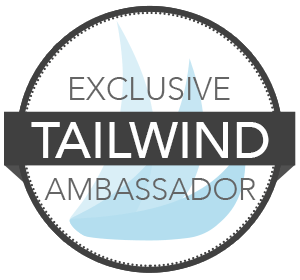 I’m a BibRave Pro Ambassador for 2016, and I’d love if you considered joining the site! 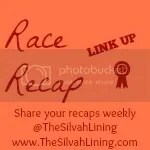 I’m also sharing as part of the Race Recap linkup at The Silvah Lining! 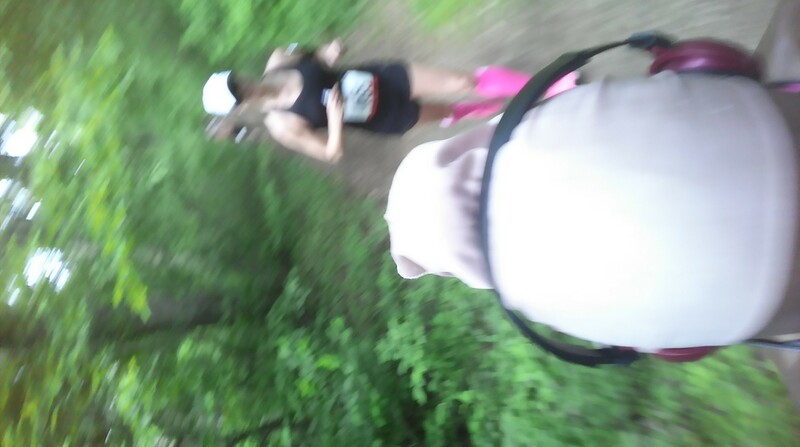 Have you ever run a trail race? What was the craziest thing you’ve ever seen during a race?